Course Duration: 24 hours or 40 hrs depending upon your time budget. 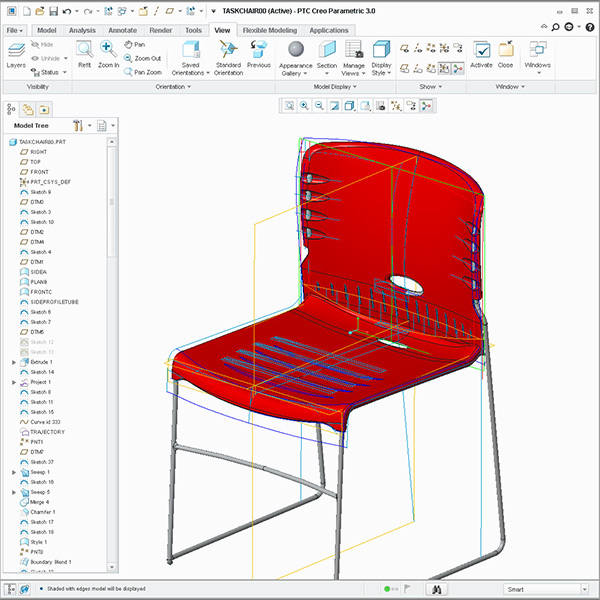 This class is for industrial designers and engineers who migrated from Solidworks, Rhino 3d or Alias Studio and also took the one-week Level 1 & the consecutive surfacing week but also requires a refresher workshop. Onsite Training: This and all Design-eEgine courses are offered onsite at your facility also. Call to speak to an account manager to arrange a class at 312.226.8339 today. Design Engine’s Seven Day Creo Intensive to industrial designers workshop or the one- week Creo surfacing intensive. Build selection sets in Creo and intense review. Intense review & re-introduction to IGES import with Data Doctor or IDD. Learn to take advantage of isoparms/isolines with respect to striation or flow of a surface. 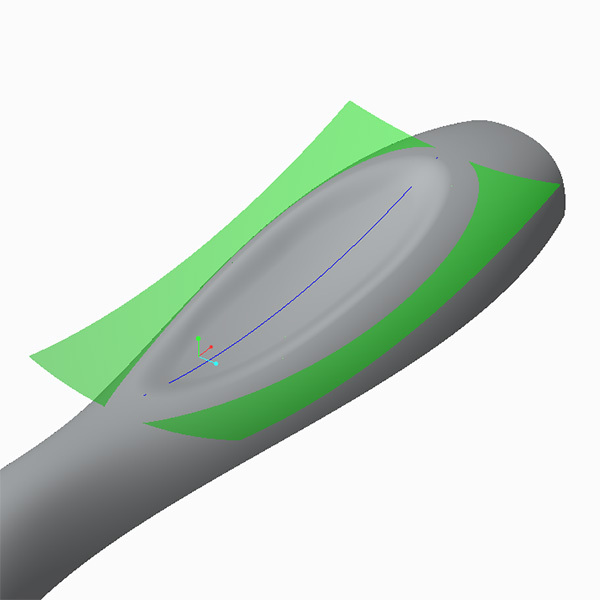 Learn about tangent issues in-depth using examples from difficult surface anomalies with or without control points. Learn advanced details of Sweeps, blends & other curve & surfacing techniques to maintain Draft. Learn techniques for capturing form by looking at various foam models and offer several starting examples on how to initiate the modeling process. Building surfaces from graph features. Discuss alternate surface creation techniques from robust curves. An introduction to 3D bounding boxes or lattice structures. Create ridiculously robust models utilizing lattice structures. 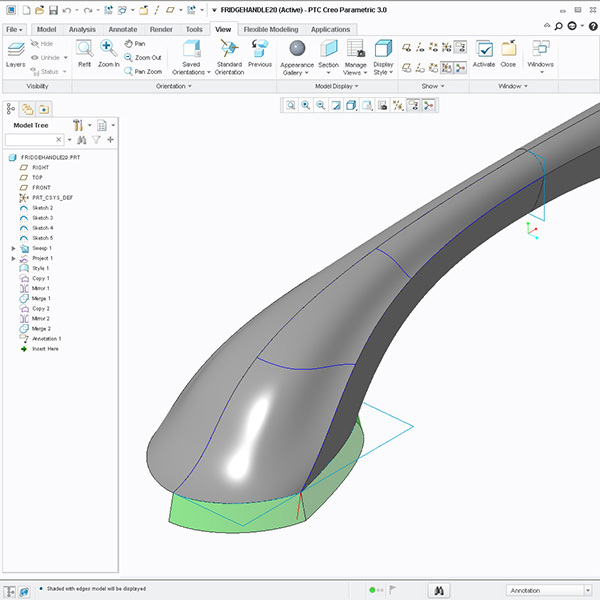 Discuss how to incorporate handles for further control as well as understanding surfaces that look at those curves. Participants, if interested, can explore curvature continuity (G2) and multiple plans of attack by looking at existing products. Re-introduction to Wet Cardboard: affecting light reflection with geometry and adding lead in for resultant surfaces. Re introduction to top down design. This time using Skeleton Parts and publish geometry. Adding bounding boxes to models in hind site. Discuss techniques for making surfacing models more robust. 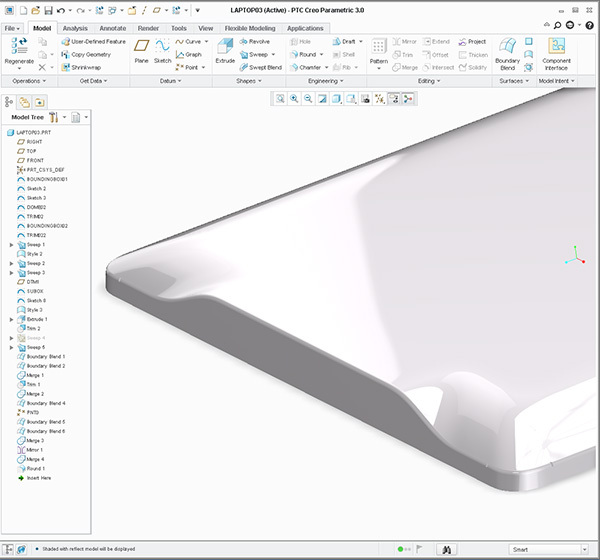 Examine differences between SW and CREO. Copy Paste + Copy Paste Special, and how to use them effectively. Parent child relations in Sketcher. Refresh of the Hole tool including countersink clearance hole. Discussion on the difference between using a separate sketch vs extrudes w/out the use of separate sketches. Examine light reflections from an industrial designer’s perspective, with respect to G2 Continuity. 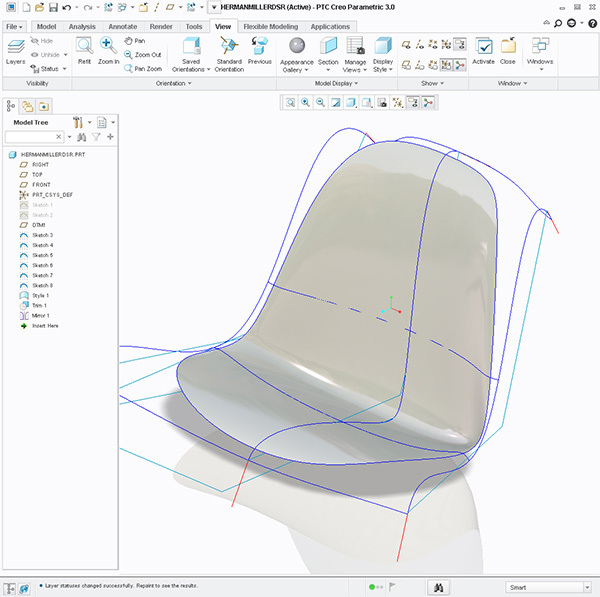 Compare Creo to Alias modeling techniques and the differences or benefits for each one. Discuss three-part to four-part boundaries with more than four examples for getting out of a corner. Discuss plan of attack and a simple approach for capturing form from foam models or ID sketches. Examine the idation process as the ability to prove form and the techniques to get multiple 3D iterations within hours instead of days. Intense review and discussion of differences between Y=X2, Y=X3, Y=X5 single span splines and full discussion on how that matters for Industrial Designers managing Curvature. G0, G1, G2, G3 discussion complete w/ examples + discussion. 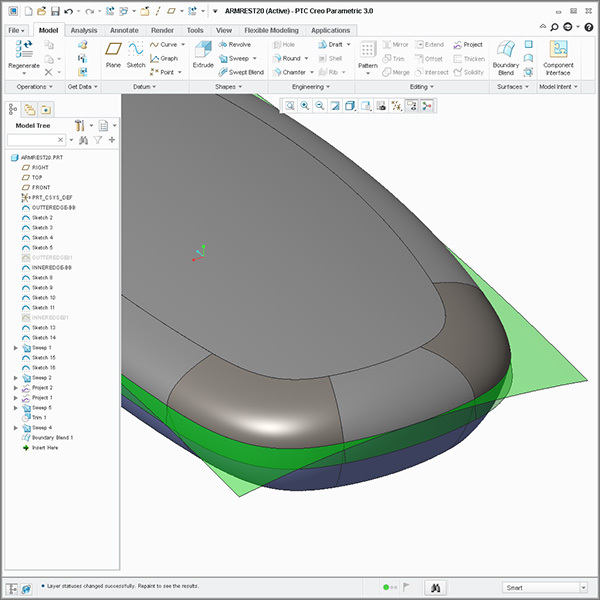 Discuss with specific examples advanced functions of Creo as well as the strengths and weaknesses by comparing it to other high-end industry surfacing software. Review techniques for building a more robust plan of attack with respect to Creo. Ventilate clam shell plastic part design as related to swept surfaces. Also discuss styling grooves with examples. Managing Illustrator artwork in Creo diametrically and build extrude geometry or other geometry from that data. Discuss with examples the plan of attach or set up process for building models. Examine in detail the techniques for avoiding 3 part boundaries and discover why expert surface modelers do not use 3 part boundaries (even masters of surfacing for reverse engineering). Polycom Speaker: 3 pronged speaker phone. Model the 3 pronged speaker Polycom. Saddle Model (review from 1st day of Surfacing class). Model a Herman Miller seat basin. ToGo Coffee Mug: three part to go mug with top down design. Calphalon Illustrator file via DXF IGES (or any Illustrator art work supplied by customer). Black & Decker suction tube: blend from square to round. Sweep & Blend project: intense review comparing sweep functions to blend and boundaries. Any projects you want to bring to the table. Be sure to have disclosures signed before class begins. This course is usually customized to focus on the students learning wishes and company projects. Bring examples of work or problematic models for in context discussions. This course is usually administered Onsite. This Creo training course is an intense & specific review where the participants previously took the course 7 day or two week creo training for industrial designers . In this workshop we help industrial designers & design engineers alike rethink, rehash, and refresh their approach product surfacing projects and to make multiple changes on your model without failed features. As with all Design-Engine classes, participants keep the training material login and password for life. Is it possible to check some sample video training videos about Creo surfacing please.